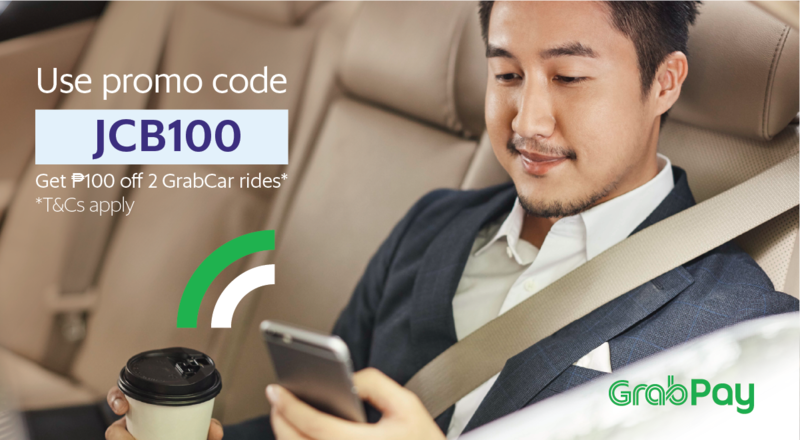 Get PHP100 off your first 2 GrabCar rides using JCB! Get up to P100 OFF on your first 2 Grab rides using your JCB Credit Card! Just enter promo code JCB100. Promo is open to all Grab users using JCB cards. Promo valid from August 1 to September 30, 2018. JCB cardholders are entitled to a maximum discount of Php100 on their first 2 Grab rides paid for using their JCB card during the promo period. The Grab ride discount is applicable to GrabCar, GrabShare, GrabCar (6-seater) and GrabCar+ (Premium) in Manila, Cebu, Bacolod and Pampanga. Per DTI-FTEB Permit No. 14223, Series of 2018.